Last weekend, I got an opportunity to test out the closed beta of Star Ocean Anamnesis, a gatcha style mobile game that will be released this summer. I got to play the game for roughly 2 and a half hours to test out the game and I got through the first chapter of the main story. After digesting my experience with the game, here are my thoughts on the game. I was pretty impressed with the 3d models of all characters and monsters in the game. All the models look like they came from a playstation 2 game. Even the lowest rarity characters had pretty high fidelity models. Though I liked the character models, there was a noticeable difference between the characters’ menu portraits and their in game models. This difference made it a bit confusing on who I was using in game sometimes. The character models of the characters in Star Ocean Anamnesis are pretty high quality and I think it’ll be pretty fun to collect all the different characters in the game. Man, the menus in the game drove me up the wall. First off, the main menu of the game is a giant mess. There’s a ton of different navigation icons on the main menu and it’s hard to tell what each of them do at a quick glance. For example, when I wanted to get to the story missions, I kept tapping on the main menu icon because the icons for the two were right next to each other and their icons looked similar. The main menu of the game could be streamlined with a little more work. 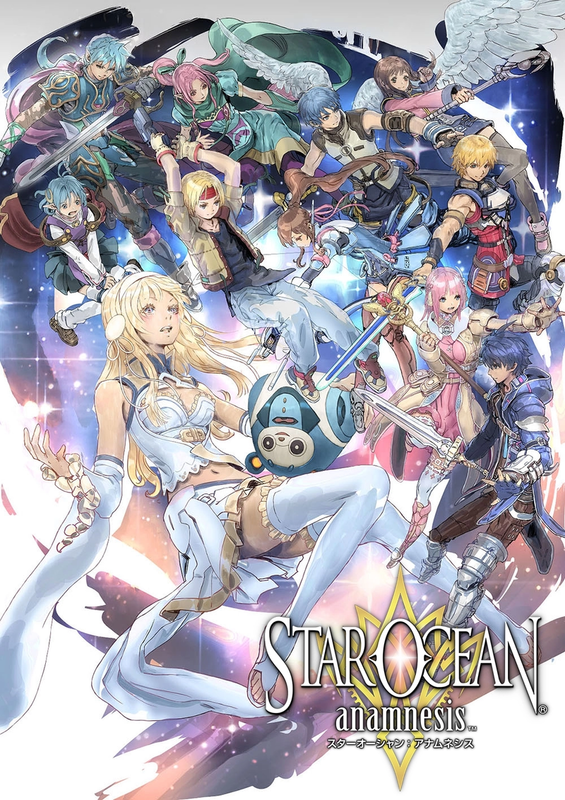 Man, the story mode of Star Ocean Anamnesis was so fun to play, despite how slapdash the narrative felt. The game sets up a clear goal at the beginning by tasking the player with trying to get back to Earth after getting shot down by some space pirates. While searching the unknown planet you crash landed on for materials to repair your ship with your ship’s AI, Coro; a mysterious girl with magical gatcha summoning powers and amnesia suddenly comes out of the blue while being chased by a conga line of monsters. After saving the girl, Evelyn, she joins your motley crew to regain her memories and go to Earth? I dunno the game wasn’t super clear about Evelyn’s goals. The only thing holding this marriage of sci-fi and fantasy together is the fact that you make your in game avatar act like a snarky jerk. Seriously, I just loved messing with Coro and Evelyn because some of the snarky answers were golden. I mean what other game gives you the option to say “Is picking bananas consider environmental exploitation?” It’s gonna be so fun to see what other nutty zingers I’ll be able to say in the rest of the story mode. Star Ocean Anamnesis is probably the closest I’ll ever get to playing a Tales of Symphonia on a mobile device. In Star Ocean Anamnesis, you’ll face off against various monsters in a 3d arena with 1 - 3 units that you’ve pulled from the gatcha and 1 character you can borrow from another player. You’ll use a combination of basic attacks, special skills, and rush attacks (hi-ougis) to take down these monsters. Movement is also pretty limited in the game because you can only move towards a selected monster or do a side dodge. Personally, I enjoyed the gameplay quite a bit. I liked the fact that you could cancel your basic attacks with special skills, which built up the gauge to your rush attack faster. It felt rewarding to string these attacks together because it felt like you were rewarded for managing your skills well. Though, the game did get moderately repetitive because I was playing a ranged character for most of the beta and I was able to mindlessly attack my way through most of the first chapter. Luckily, the game also has an auto-battle function that works pretty well to take of the grindiness of the game. Though I enjoyed the gameplay, I’m worried that the game won’t remain challenging enough to keep me invested in the game. It felt like if I decided to over level any of my units slightly, I’d basically break the game’s difficulty into tiny pieces. I’m actually surprised at how well handled the gatcha mechanics are implemented in Star Ocean Anamnesis. However, I have one huge issue with the implementation. My problem is the fact that the game splits its gatcha pool into two separate gatchas. There’s one for character pulls and one for equipment pulls and I feel this will be a pain to deal with. I dread having to choose whether to use my gatcha resources on one or the other gatcha. The only way I imagine I could work around these two gatchas is to spend real money on the gatcha currency, which I’m loathe to do. The two different gatchas aren’t a deal breaker, but I’d prefer not to have to divide my resources between the two gatchas. On the other hand, I love the fact that the game allows you to choose a SSR unit to add to your team at the beginning of the game. It’s a great way to give people a head start on in the game. Also, rerolling for rare characters should be pretty easy to do as well because you can change your profile name at any time. This means that you can install and reinstall the game as much as you want until you get a really good gatcha pull at the beginning of the game without too much trouble. Star Ocean Anamnesis’ gatcha has pretty good baseline gatcha mechanics, but ultimately the gatcha’s quality will depend on what’s added to the gatcha in the future.